When we are talking about artificial intelligence in journalism, we need to talk about the human-centered aspect, said Nick Diakopoulos, assistant professor in Communication Studies and Computer Science at Northwestern University on April 13 at the 20th annual International Symposium on Online Journalism (ISOJ). Diakopoulos, who is the director of the Computational Journalism Lab and was chair of the talk, “The impact of artificial intelligence and machine learning on journalism,” says all the components that dictate an AI machine such as what kind of data was used to train the machine, how that data was used and defined, what input a system pays attention to, are all decisions made by a human. “Artificial intelligence systems are tools at the end of the day,” Diakopoulos said. “They are built by people to serve needs and goals and values, and that makes them fundamentally critical tools. They express the values developers chose to develop into them,” he said. He added that when used properly, artificial intelligence can suggest “real opportunity for journalists and news organizations” to use these tools to drive news production and dissemination. However, Ling Jiang, senior data scientist at The Washington Post, said there are certain challenges with using artificial intelligent tools in the newsroom. Machine learning tools can be very helpful in reducing repetitive and routine work for a journalist, but reliability is still a big issue. “Machines cannot correct themselves without human interaction,” Jiang said. She added that the machine learning tools can be as good as the data and the people behind the data, in order to help it solve the issues it’s designed to do. The Post uses ModBot to moderate content on comment sections, Jiang said. Whenever there is a “bad comment,” the ModBot will rank these comments. ModBot will automatically delete certain comments it detects as harmful or unproductive based on a threshold, Jiang said. Some fear that AI will take journalism jobs away, Diakopoulos said. But only about 15 percent of a reporter’s job and 9 percent of an editor’s job can be done by an AI machine. Complex communication, which involves reporting, interviewing, transcribing and going back to get more information, writing the story with nuance and balance, are skills humans can do, Diakopoulos said. 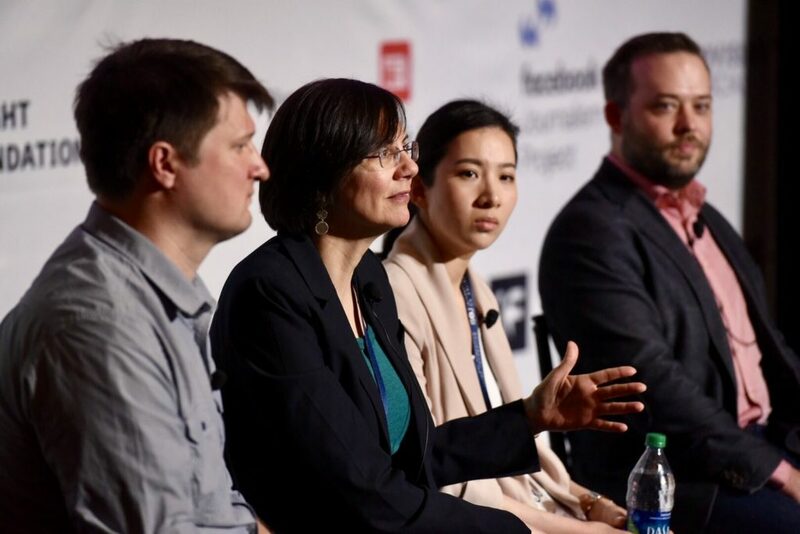 The Associated Press uses artificial intelligence to maximize the news production and news gathering process, said Lisa Gibbs, director of the news partnership at The Associate Press. She talked about how the AP was able to infuse innovation and entrepreneurship into the AP by working with a data vendor called Automated Insights. Through using the Automated Insights system, AP was able to produce 3,700 company earnings stories versus the 300 stories they were able to produce before using the system. She added that 40,000 seems like a large number, but considering that the AP produces about 1,000 stories per day, it’s still small scale – but it’s growing. Another interesting project the AP is working on is trying to see if they can help local news organizations gather documents in a more efficient and easy way. As for news gathering, AI is used to help the AP with event detection by scanning the sea of social media channels and identifying potential stories that could work for AP. Certain algorithms such as NLP, NER and geolocation, help AP scan social media and detect news faster, Gibbs said. Social media authentication of verifying whether a story or video has appeared on the internet before, is another helpful tool, Gibbs said. There are currently about 500 engineers who work at Bloomberg and help with AI projects and other technical issues at the news organization, said Clay Eltzroth, product manager for Bloomberg News. But he emphasized the importance of teaching reporters what AI machine learning can do. “I think the education around AI and machine learning is one of the biggest things for newsrooms going forward,” said Clay Eltzroth, product manager for Bloomberg News. Michael Morisy, who is the co-founder and chief executive of the MuckRock Foundation, says his organization helps newsrooms file and track public records requests. So far, the organization has been able to file and track over 60,000 files, which breaks down into categorizing 336,840 inbound communications with various government agencies, Morisy said. Diakopoulos, who led the Q&A session afterward, asked the panelists what kinds of skills would be helpful for journalists going into machine learning and AI. Eltzroth said coding would definitely be useful, but also understanding the what coding is and being able to explain it to others in a comprehensive way is also important. “If there are things machine learning cannot do, the biggest thing is education people on what is out there and what it can do,” Eltzroth said. A journalist who can think about these problems not as one isolated problem, but systematically, would also be an essential skill, Morisy said.